NEW HAVEN, Conn. (AP) — The black-and-white photo on the wall of Jennifer Tracey-Carlo's heating oil company shows her father and grandfather standing beside a small fleet of gleaming delivery trucks, offering a glimpse into a time when oil was king and honoring the two men who built the business. "We have their grandchildren," she said of customers whose families grew up with hers. "As people moved further, we'd move with them." While state officials say they're leveling the playing field, business owners who say natural gas is touted as a clean alternative drilled in North America as their product is being smeared as a dirty fuel imported from the Middle East are getting lessons from marketers in how to fight back. "It's not just us. We're all kind of in it together," Tracey-Carlo said. "There are people that are going to go by the wayside." Started in a basement in 1931, Tracey Energy now operates in a neighborhood storefront where customers paying their bills are greeted by Grace, the Carlo family's golden Lab. It survived the Depression, the two oil shocks in the 1970s and a run-up in oil prices that began five years ago. Kevin Rooney, chief executive officer of the Oil Heat Institute of Long Island, a trade association, said oil sales volume is down because furnaces are more efficient. Homeowners who have spent up to $4,000 to upgrade their burners are not likely to spend thousands to convert to natural gas, he said. "They've already made the investment," Rooney said. "It should be a no-brainer," he said. "Why would you want to pay all that money for oil?" "We're here to stay," said Tony Malandra, president of Yeager's Fuel in Allentown, Pa. "We see this threat of natural gas as a threat, but we've been punched in the face before and hopefully we'll be viable after this." "We have to get off the mat and fight," he said. 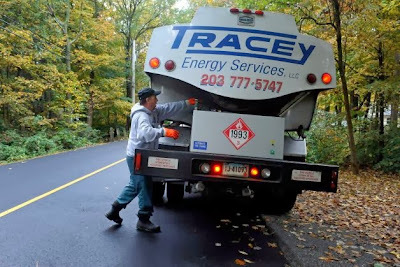 Daniel Esty, Connecticut's energy commissioner, says home heating oil lobbyists have been "misinforming people" about the state's role in energy policy. He said the expansion of the state's natural gas distribution system is leveling the playing field that had been tilted to the home heating industry. "The biggest thing against us is the government," she said. "We're all working hard. We're trying to make a living." Associated Press writers Clarke Canfield in Portland, Maine, and Michael Rubinkam in Allentown, Pa., contributed to this report.